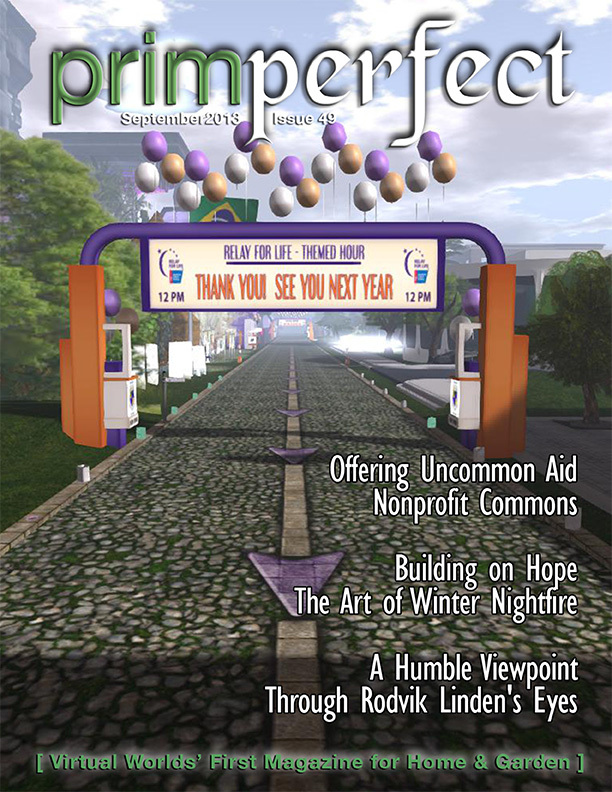 Prim Perfect’s special new issue on nonprofits in virtual worlds is out now! Welcome to our special nonprofits issue of Prim Perfect magazine, where we take a look at just some of the amazing work that is being done by and for nonprofits around the grid. 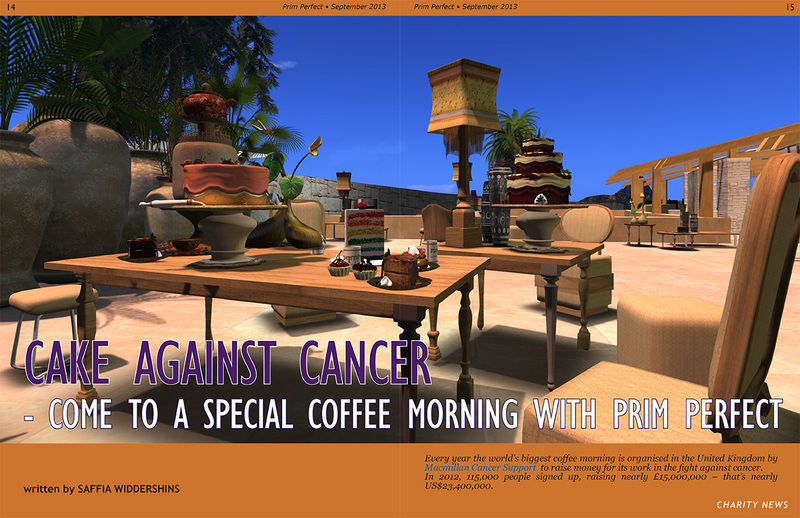 This has been a great year for one particular nonprofit in Second Life – the American Cancer Society (which is the organisation behind Relay for Life). In this centenary year, a record amount (over US$390,000) was raised in the Relay Season. To celebrate this, PJ Trenton has produced a photo essay looking at Relays – and Relay events – past and present, while Beq Janus submits a report on this year’s Relay weekend. 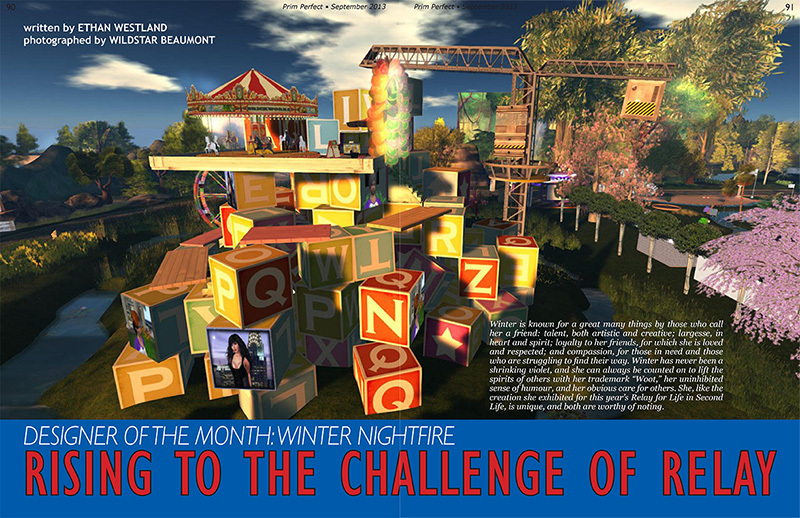 Our Designer of the Month in this issue is Winter Nightfire – Ethan Westland talks to her about her work and also explores the beautiful Survivor and Caregivers’ Camp that she created at Relay for Life weekend. 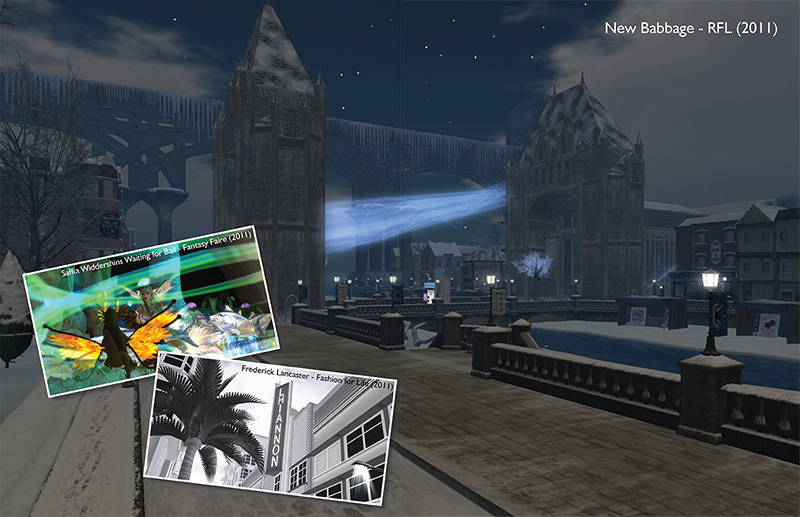 And we have another interview, too, as Inara Prey talks to Rodvik Linden, the CEO of Linden Lab, the owners and developers of the Second Life platform. But there’s much more on nonprofits – because there are many more in Second Life, exploring different areas of needs and concerns. 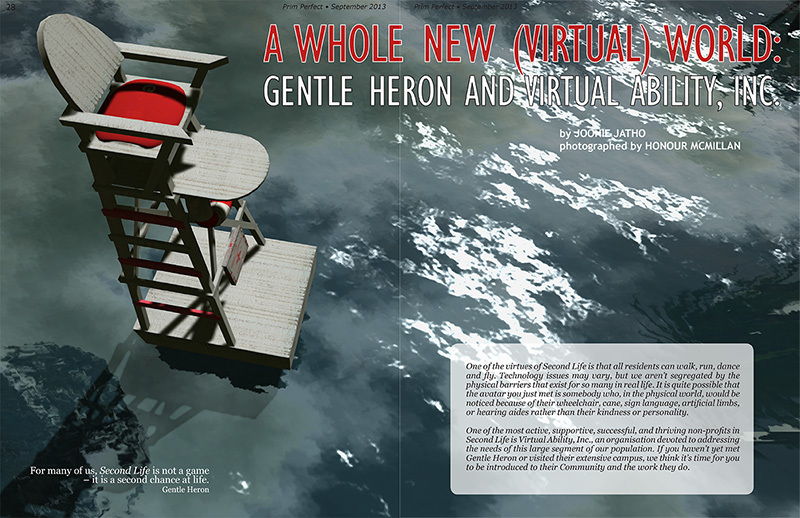 Joonie Jatho speaks with Gentle Heron and learns all about the work of Virtual Ability, a nonprofit that reaches out from the virtual to the real world. And Judi Newall learns all about Nonprofit Commons, the regions set up by the organisation TechSoup that have brought a wealth of nonprofit endeavours to the grid. Ceejay Writer explores the variety of nonprofits that are on the grid, while Qwis Greenwood takes a closer look at two of the smaller nonprofits. Eva Bellambi writes about her own experiences with raising money for breast cancer – and provides a useful checklist for people who want to become involved in fundraising. 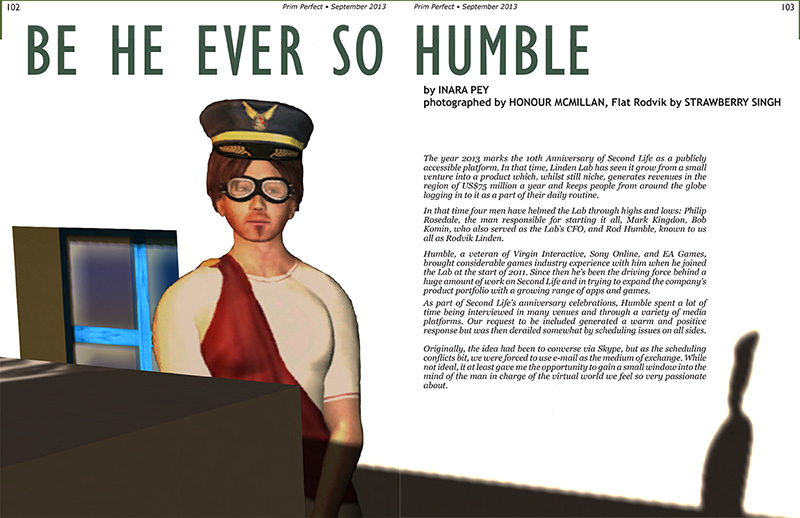 Honour McMillan explores spontaneous fundraising in Second Life, while I look at issues of awareness and the role of large scale fundraising like Relay for Life. Are other nonprofits missing out here? 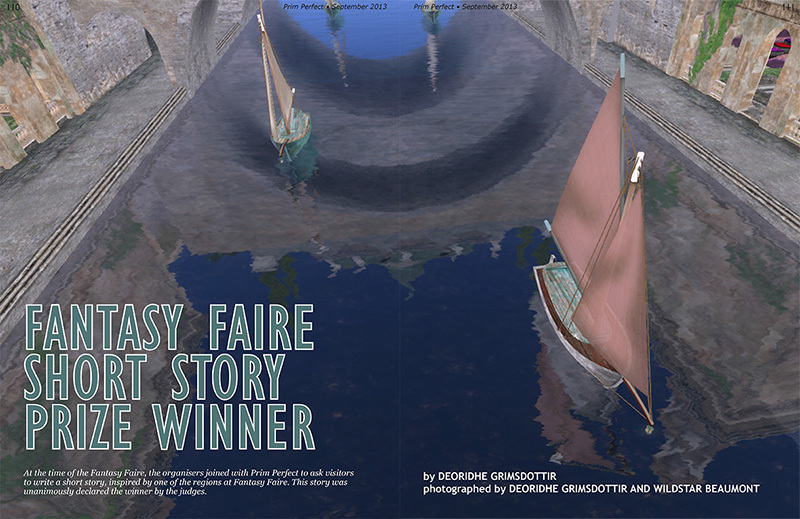 We also have the winner of the Fantasy Faire Short Story competition, “Red Sail at Sunset” by Deoridhe Grimsdottir. 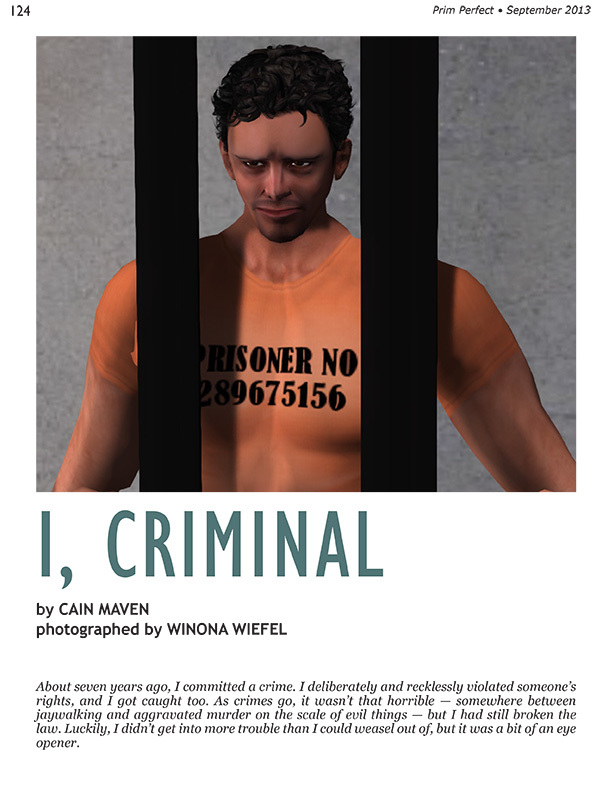 And there are some very timely thoughts on intellectual property rights from Cain Maven. As a special preview, we are launching the Prim Perfect Coffee Morning for Macmillan Cancer Support. We’re asking for your support – and your best cake recipes! Read all about it on Page 14. You can get the latest issue inworld – and copies of all our earlier issues too – at our head offices at Pointe LaRue Isle. It has a great cafe to relax in while you’re reading the latest issue too!